If you have an earlier version installed, use Control Panel/Programs /Add and Remove to uninstall it. Double click on msi file. Tyros models and PSR's have limits to the number of files per folder on the hard drive or USB, typically either 250 or 500. When the limit is reached, an error is generated and further access is restricted. This makes it difficult to correct the problem using the filemanagement tools on the instrument. FolderCheck is a utility designed to assist in managing folders using the PC. This program replaces the earlier utility called "HD Check". 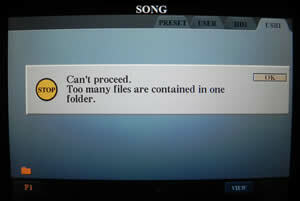 It scans folders on the computer, on USB storage media connected to the PC, or on a hard disk on the Yamaha instrument connected via the MusicFinder-button-initiated Storage Mode. The number of files in each folder is displayed with more than 200 highlighted in red. You can then address any issues by clicking on the Split function provided by the program to divide a selected folder into two equal parts or use the Windows Explorer to copy and paste files to other folder locations. 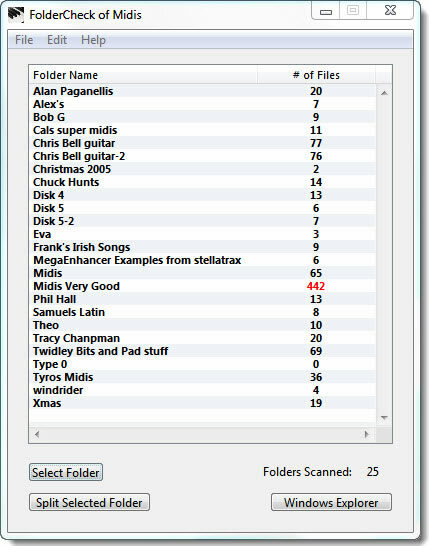 For example, in the screen image shown here, the "Midis Very Good folder (with 442 files in the image above) is split into two folders. After starting the program, select a drive, USB stick or any folder structure on the Tyros or the PC (for example a USB storage device currently connected to the PC). As soon as you have made your selection, the program will begin scanning and report the file count in each of the folders. Folders that contain 200 or more files will be displayed in red. You can then address any issues by clicking on the Windows Explorer or use the Split function provided by the program to divide a selected folder into two parts. Order any PSR Tutorial Resource set or make a donation to become a "Supporting Member" for life! (c) 2017 PSRTutorial.com.